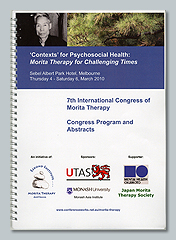 The 7th International congress of Morita Therapy was held in Melbourne in March, 2010. The chair of the congress was Dr. Peg LeVine(Monash Asia Institute, Monash University, Mebourne, and Director of LeKond Institute & Centre for Morita Therapy, Daylesfond, Victoria, Australia). Kei Nakamura, M.D., Kenji Kitanishi, M.D., Susumu Maruyama, M.D., Ishu Ishiyama, Ph.D., Katsuhito Ito, M.D., Kazunori Tatematsu, M.D., Ph.D., Toshihide Kuroki, M.D., Ph.M., Mikkiko Kubota, M.A., Kazuyuki Hashimoto, M.D., and Mistuhiro Ichikawa, M.D. 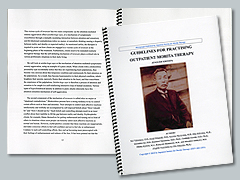 The 6th International congress of Morita Therapy was held at the University of British Columbia in Vancouver, canada. The chair of the congress is Dr. Ishu Ishiyama,an associate professor at U.B.C.